Belemnites (or, at least, pieces of Belemnites) are a common fossil with a worldwide distribution. 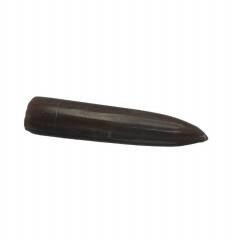 Belemnites are a common fossil found worldwide, through the Jurassic and Cretaceous periods. 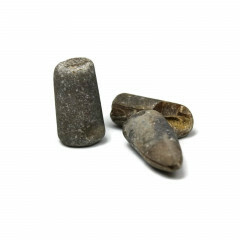 Specifically, the common fossil is a part known as the ‘rostrum’ – the soft pieces of the Belemnite rarely fossilise. The rostrum is thought to have been a counterbalance to the head of the squid, used during swimming. As these pieces are found worldwide, they are of tremendous help to geologists; helping with the study of current direction, ambient temperature, and climate. In the UK they can be found in the cliffs and on the beaches around Charmouth, as well as many other locations – even in household gravel, sometimes. In Australia, opalised Belemnites have been found with gorgeous play of colour. Spirituality and Crystal Healing with fossilised Belemnites. 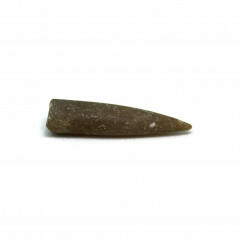 Belemnites do not appear to be used often in crystal healing but there are some interesting European folklore traditions and tales based around them. One belief is that these fossils were formed from the points of lighting strikes that hit the ground – many called them ‘thunderbolts’, ‘devils fingers’, or ‘St Peters Fingers’. In Scandinavia, belenites were referred to as vatteljus, in the belief that elves and pixies used them as candles. People believed in their healing powers, too – particularily when crushed. Honestly, we don’t recommend it.